As a regular visitor to India, I am sure I am not the only person who has noticed the large numbers of youngsters in every city. Of India’s 1.3 billion people, 40% are below the age of 20. In spite of the vibrancy of the Indian economy, with growing IT hubs in Bangalore and Gurgaon, the rate of job creation lags behind the number of young job-seekers. Unless the rate of job creation improves, what has been called a ‘demographic dividend’ may end up in a ‘demographic timebomb’ adding to the number of young people unemployed, disappointed, confused and asking, but not receiving answers. Given all that, it is not easy to write a book that is refreshing and, above all, a book of hope. Neither a management book nor a ‘how to’ book, Make the Best of Your Life: Letters to Bahujan Youth was originally published in Forward Press magazine under the pen name ‘Dadu’, which is a word for Uncle. Reading the book is therefore like taking a peek into an ongoing correspondence between an Uncle with his younger relatives – relational, warm, and packed with very practical advice. Helpfully, the book is divided into three sections: Life, Education and Work, covering commonly asked questions on topics as far ranging as health, confidence, ambition and marriage! What you will glean from the book is wisdom and insight that takes into account the uniqueness of Indian culture and blends it into modern day realities. Prabhu Guptara balances the traditional with the modern, freedom with conformity, and individual rights with cultural responsibilities towards family and wider groups. Make the Best of Your Life provides the reader with both thought provoking and heart-searching realities in a lighthearted, but very real way. The book will also help business leaders, HR practitioners, educators, and government officials to appreciate the real issues being faced by young Indians in the growing, and sometimes confusing, landscape we love to call our India. 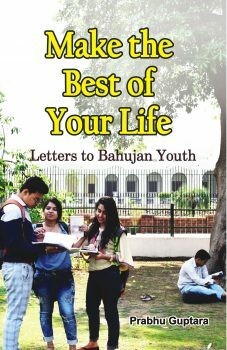 Make the Best of Your Life: Letters to Bahujan Youth by Prabhu Guptara is published by Forward Press, New Delhi in both Hindi and English.